Hiya, now here’s a problem you might be able to help me with. I think this household has been drinking PG Tips for well over thirty years – it has been the preferred tea that met the variety of flavour-requisites of those living here. Nothing fancy – unless you think their pyramid shaped bags are fancy – just straight-forward tea – everyone drinking it with milk (this is important to know later) some liking a strong cuppa – some (me) with so much milk in it most people would wonder where the tea was. Now this maybe because they are usually dish-washed between uses, though rarely were they rinsed immediately after use (recommended for avoiding stains) before putting into the dishwasher. This may be due to the fact that we have very, very soft water (hard-water virtually guarantees staining – apparently). It may be due to the fact that no-one in the family drinks tea black (milk proteins are said to bind to the tannin preventing it sticking to the cup). All of the above are suggested by the internet as ways to make sure your tea-cups do not stain. BUT – all of a sudden, about six-months ago, the stains started to appear! WHY? Same cups. Same regime of ‘cleaning’. Same soft water. Same tea-with-milk. Same tea … Or is it? Over a year and a half ago PG Tips reduced the quantity of tea in its bags. We are talking a 0.2g reduction on 3.1g. Not a lot – but they claim ‘just as strong a brew’ and I wonder how that can be? I recall a demonstration at a tea-plantation in Malaysia where they poured cold water onto different tea bags, one high quality – one lesser. The inferior one leaked colour quite quickly, the better much less so. 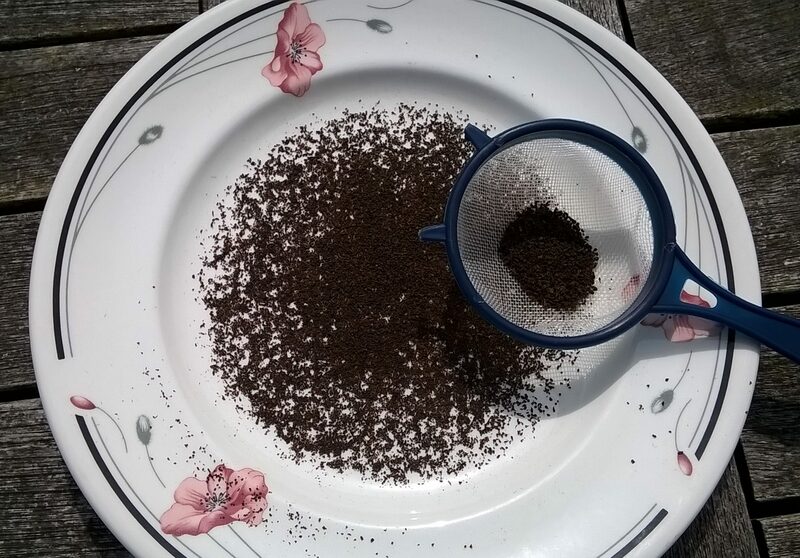 We were told that this was because the inferior one contained tea-dust which enhances the colour (yes, still tea-leaves – but very fine particles) and that these ‘leaked out’ through the bag making the tea look stronger. 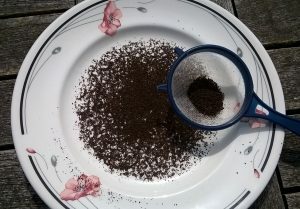 Lacking a ‘high-quality’ bag to compare it with in this manner, instead I broke open a tea bag and put it, dry, through a tea-strainer – not a lot stayed in the strainer as you can see … and how fine is ‘dust’ anyway? Not very scientific, I know – especially with no ‘old-size’ tea-bag to compare it with. 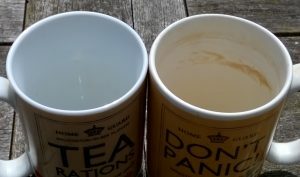 So I am not casting aspersions, as such, but I wonder if something like this has gone on – and that this is why the tea we have used for so many years now creates these ugly stains even in the nicest and smoothest of china-ware. Whatever – I now have, for the first time ever, tea stains to contend with! Now I have a regular task of dealing with this problem and have found my new friend Bicarb is in on the act, along with white vinegar. Which is good because I didn’t want any new chemicals in my life. I now keep a small bottle of half and half – water and white vinegar – handy. I pour some of this onto a sponge, give the mug a wipe around, coating the inner surface with the mixture. I then pour a little Bicarb out, dab the sponge into it then rub around the inner cup, with an extra rub where/if there’s a tide-line. A good rinse – and this is done – then into the dishwasher it goes – and comes out sparkling! Also … when I have finished the couple of boxes I have in my cupboard – I think I will be experimenting with other teas to see if any of them meet the exacting flavour standards AND do not create stains! So, dear readers, can you help me? Does yours stain your cups? Categories Healthy LivingTags getting rid of tea-stains, no-chemicals getting rid of tea-stains., Tea-stains, Why do PG Tips stain my tea cups now? Anne you might like to try Thompson’s tea, specially made for soft water, available in Scotland, not sure if you can find it everwhere, I buy it when I find PG very hard to get up here, usually only available in the cheaper shops.I find it quite a nice cuppa. Thank you for your recommendation of Thompson’s tea, as it is specially made for soft water ! It sparked a memory – I think I heard that Miles teas (down here in the SW) were also blended for the water of the region – so I may look into them too! I have had exactly the same problem with Tetley tea bags for the last couple of months. I thought the fault lay with my dishwasher but after extensive cleaning, the result is the same, ugly stained mugs. I can also see a residue of dust at the bottom of mugs after drinking which never used to occur. I suspect that the quality of the tea has been compromised for the sake of profit. Our cakes and biscuits are getting ever smaller but remain the same price. I feel cross that I am now forced to clean the mugs before they go into the dishwasher! Yes, SO annoying – especially when you are just buying your usual tea – not just because it was a bargain or something.